If you have often thought you would like to ride a motorcycle or scooter, but didn't know where to start. Perhaps you are a bit concerned that CBT is a bigger step than you want to take. Then you could benefit from taking our 2 hour Novice Introduction. For £45 you can have 2 hours One 2 One instruction dependent on availability . If you want to come with someone else thats fine, we are here to help. We use our 1000ft runway extension here at Dunsfold Park where there is plenty of space to feel comfortable. The idea is that you get long enough on the bike to get real control and build your confidence so you look forward to taking your CBT knowing you can ride the bike. This is not a once round the carpark in a group and book you in experience. By the time your session ends you should be changing gear, cornering, negotiating obstacles, and various exercises relevant to both riding on the road and tackling your CBT. We think 2 hours is the right amount of time to achieve this. It's enough for you to know if you want to take it further and enough to achieve your aims , but not so much that you are struggling to take it all in. If you want to do more you can. Most of these intros are conducted by Audra, who is herself only 5ft 2 , so knows all about some of your concerns if you are not so tall. Below is an extract from an article by Jane one of Audra's "Ducklings" which appeared in a local bike club magazine. "Audra had much more confidence in me than I did and she successfully took me well beyond my comfort zone. Sometimes you need an ‘Audra’ in your life simply to change your "I can't into a, How about that, I can!" That was in 2009. 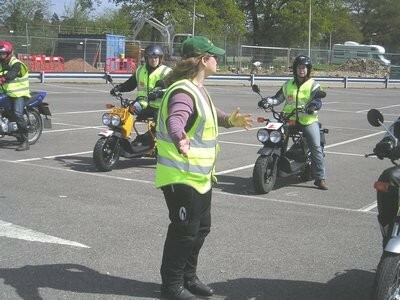 Since then there have been many more riders come into the fold that may never have taken the first step if it hadnt been for Audra or one of our other brilliant instructors to help them . Even if you think you don't need this, or if you have never ridden you really ought to consider it. CBT will be so much easier if you do.